Edmond Hoyle, Gent. : Schools for Whist? Hoyle was a tutor at whist before writing his Short Treatise on the game and instruction in gaming became a target of satire. 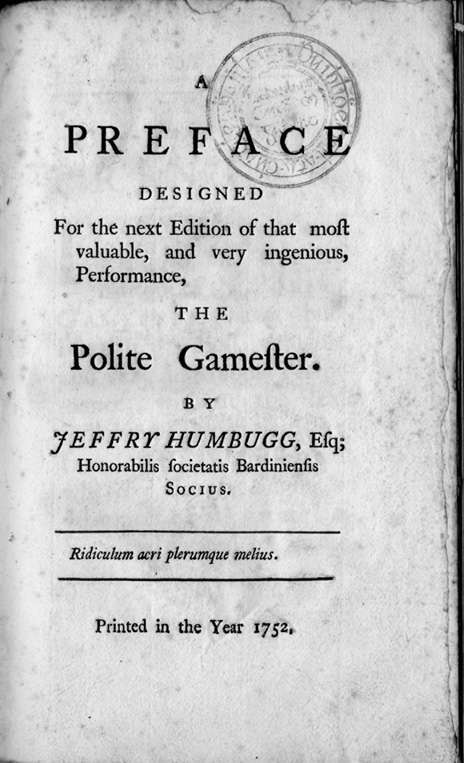 One of the most extraordinary examples is a 1752 pamphlet called A Preface Designed...for the Polite Gamester, 1752. It is excessively rare--only a single copy survives at the Dublin City Library and Archive as part of the J. T. Gilbert Collection. 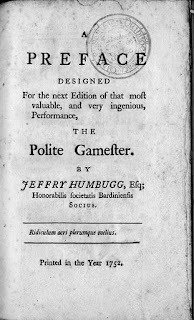 Two competing Dublin editions of The Polite Gamester had appeared in February 1752 (ESTC N22882 and N24780), perhaps prompting this preface. The story of those books and the competition between them will have to wait for another time. Gaming with public money? I'll leave it to the reader to make twenty-first century analogies with sub-prime lending. The education of females is at present happily elevated far above the ordinary employments of domestic œconomy; and if any school is wanted for the improvement of young ladies, I may venture to say, it should be a school for whist. Mr. Hoyle used, indeed, to wait on ladies of quality at their own houses to give them lectures in this science: but as that learned master has left off teaching, they can have no instructions but from his incomparable treatise; and this, I am afraid, is so abstruse, and abounding with technical terms, that even those among the quality, who are tolerably well grounded in the Science, are scarce able to unravel the perplexity of has cases, which are many of them as intricate as the hardest proposition in Euclid. A school for whist would, therefore, be of excellent use; where young ladies of quality might be gradually instructed in the various branches of lurching, renouncing, finessing winning the ten-ace, and getting the odd trick, in the same manner as common misses are taught to write, read, and work at their needle. When [my son] had finished his studies at the university, and perfected himself in town in all the necessary accomplishments of a young man of fashion, I sent him under the direction of a very excellent tutor, on his travels through France, Italy and Germany; from which, after an absence of four years, he returned last winter, improved beyond my utmost hopes. But, alas, sir! when I expected to see him the admiration of all companies, and to have been ever where congratulated on the happiness of having such a son, I found, from the universal attention to cards, that his acquirements were totally unnoticed, and that all the cost and trouble I had been at in his education, answered no other purpose than to make him company for himself, and a few unfashionable friends who have no commerce with the world. If this insatiable passion continues, it were as well if our public schools and universities were abolished, and that travel and all other means of acquiring knowledge and refinement were at once prohibited; and in their places, other seminaries erected in this metropolis, and proper masters appointed, to instruct our children in the rudiments of brag, cribbage and lansquenet, till they were of a proper age to study whist, and the other games of skill, at the academy of Mr. Hoyle. Yes, gaming was quite the rage in Dublin and London, with Hoyle was seen as the cornerstone to education. J. T. Gilbert, A History of the City of Dublin, Dublin: McGlashan and Gill, 1859.